Our needs assessment this year showed that our high school students are majorly stressed out (no surprises here). They need help with soft skills like time management, study skills, and stress management. Mindfulness seems like a buzz word in the counseling world, but it's because it's something our students are really needing help with. I'm always looking to create new, visually appealing bulletin boards for our main hallway. THIS ONE has 8 mindfulness techniques (positive self-talk, guided imagery, journaling, affirmations, desk stretches, progressive muscle relaxation, mindful meditation, breathing techniques) that a student could learn about and immediately practice in their classroom. 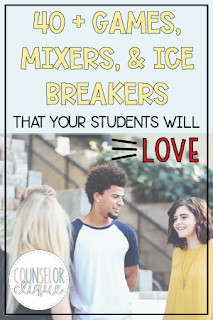 Each of these coping strategies have cardstock take-aways that students can take out of a pocket and bring back to a classroom with them or bring home with them. To pair with this, we snagged a few minutes at our monthly faculty meeting to educate teachers on mindfulness, ways they can use some techniques in the classroom, and some of the recent research on it. We showed them that all educators can get a free subscription to Calm.com which has meditations, sleep stories, music, and body relaxations. To get your own subscription using your school email (it's your log in for life-- even if you leave education! ), go to calm.com/schools to register. A real life human will approve your request, so it takes a few days. 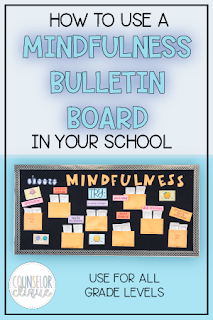 1- I loved seeing a boy pause to read the board, grab a piece of cardstock for "Progressive Muscle Relaxation" and stick it in the side of his backpack, and skitter off quickly. 2- I loved seeing a teacher post the "Affirmations" cardstock in her classroom by the door as students exit. Positive self-talk and affirmations can really change a mindset if practiced regularly! If you DO already have a good working relationship with your principal, you already know how valuable this is. If you don't, maybe it's something you wish you had. Maybe you're thinking... SURE, that sounds wonderful, but you don't know my administration. I will admit... I think I've had it good for the past 5 years. If you have the opportunity to find a principal to work for who supports school counselors, you've truly found a treasured gem! 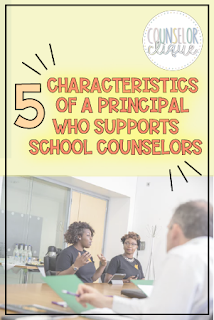 I want to let you know 5 characteristics I've noticed of a principal who supports and understands school counselors. 1- The principal makes policy based on appropriate counseling duties. When we really started pursuing RAMP, our principal started to understand the ASCA National Model and how our time should be best spent. He took testing off of our plate, so that we could and would fill our days with appropriate duties for school counselors. I know our principal has seen this list, and I feel so respected as a professional who is known and heard in this way. 2- The principal holds school counselors to the high standard they should hold in the school. This is closely woven into appropriate vs. inappropriate school counseling duties from number 1, but I think there is something more to it. As an unsupported counselor, you may feel strongly to advocate for GETTING RID of things that don't belong to you. BUT- have you thought of really pushing the things you SHOULD be doing? A good principal holds their school counselor accountable to being data driven and proactive. They should want to see your data from your programs, classroom lessons, and small groups. I know there are school counselors who are "old school," who would rather sit behind a closed door and their computer screen. Principals who step up and hold their school counselors accountable to their yearly data-driven SMART goals and uphold their annual agreement will push their school's school counseling program to new heights. 3- The principal makes an effort to call you a "SCHOOL COUNSELOR." Maybe this is just a thing that I love... but I do. A proper title garners respect. A principal who recognizes that you're not an old school guidance counselor, but you're a 21st century, new age school counselor is one who cares about what your job is. We are called school counselors in announcements at school, on phone blasts home, and at faculty meetings. We got a new sign outside of our offices that says "School Counseling Department" instead of "Guidance Department." Direction comes from the highest school leaders down. When a principal uses the right terminology and sets the example, it can permeate the DNA of the school. Teachers will start to recognize the change and understand the importance. There were small, incremental changes over the past 5 years that got us to where we are... and that came from the direction of a principal who cared to use the correct language. 4- The principal is student-centered. Between the principal and the student is a school counselor. It is refreshing to work for a principal who cares about students... one who knows their names, who is visible in the hallways. Knows the star athletes and the students who are on the verge of not graduating. Knows the student who just had a baby and knows the first-generation student who got a full ride scholarship to their dream college. I guess what I'm trying to say... is that I love a principal who knows their students well and wants to celebrate with the school counselor. Instead of always focusing on numbers and graduation rates, it's encouraging to work alongside the principal who truly wants the best for students... just like you do as a school counselor! 5- The principal asks "how can I support you?" Sometimes it's finances, sometimes it's just walking by and saying hello in the mornings. The fact that a boss/higher up humbly asks how to best support you is a game changer. This principal is approachable and available for better or for worse. This person helps you think through tough situations and keeps things confidential when you need them to. Are there other things you would add to this list? How does your principal best support you as a school counselor? I have spent so much time working with high schoolers and middle schoolers over the years. I've been a camp counselor, a school counselor, a Young Life leader, and a church small group leader... not to mention just a fun person who likes playing games (ha!). Through all of these, I've kept an ongoing list of games I've collected, made up, and made work for me and my groups... and I'd encourage you to do the same. My "Games, Mixers, and Ice Breakers Pack" has more than 40 games on 17 pages. I've played ALL of them before. I've tweaked things to make them work better for me in different settings, with different amounts of students, or with limited materials. Party Hats: Each player wears a party hat and holds a rolled up sheet of computer paper. Object is to hit players’ hats off their heads. Everyone runs around like chaos to be the last one standing. I hate that I even have to have a crisis bucket. But when I saw Simply Imperfect Counselor's post on Instagram and her blog of her "Grief Tub," I knew I needed one on my shelf a long time ago. Since I've been at my school, I have encountered too many student deaths. (ANY is too many- let's be real.) Unfortunately and fortunately, we have a pretty solid crisis plan that works well for us at our school. 1 and 2- Self explanatory. We have these wherever we are doing grief counseling. We also grab some bottles of water or a pitcher and fill it with water and have cups in the room where we station ourselves. When we huddle with our team, we decide where we are going to be stationed for the day to welcome students to talk. When students walk in, we have them sign a sheet with their name saying they were there. This way, we can follow back up with individual counseling or know names to invite to a grief small group if necessary. 3- Our school librarian prints a giant poster for the student who has died saying the student's name at the top. Sometimes it has a yearbook picture of the student if that is available. We make this poster available in our lobby, in our conference room, or in a secluded room that we are doing more intense grief counseling. Students use the nice, Papermate flair pens to sign the poster. We also use these pens for students to write letters to the family or their friends if they want. When an administrator or counselor visit the family or attend the funeral, we bring this with us. 4- My crisis plan includes what to do if you are notified of a student death OUTSIDE of the school day and a second for what to do if you are notified of a student death DURING the school day. Your school may choose to do things differently, or you may already have a great plan in place... this is just what seems to work for us. 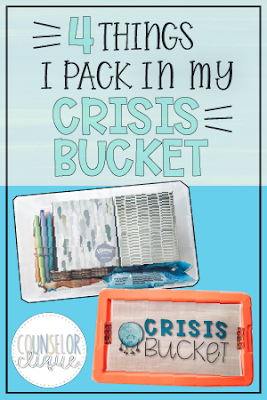 CLICK HERE to download my school's crisis plan along with the printable you see on the top of my bucket. Once a quarter, we host "Coffee with the Counselors" for our parents. 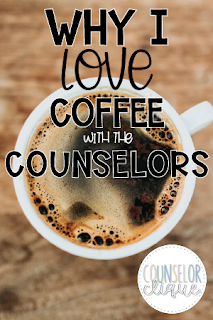 Maybe we could have thought of a more creative name for this, but let's just call it what it is... We pick up coffee and doughnuts and have an interactive, conversational morning with parents of all grade levels. We offer social/emotional topics that they're not going to find at an evening open house, parent info night, curriculum night, or a PTSA meeting. We've found that quarterly hosting doesn't wear us out too much, and we always have parents show up. It's always a small setting. Usually 5-25 parents come to hear about the topics we or a guest speaker present on. Our main ways we advertise the event are email, text message, phone blast, and social media. If I go back in the archives, I can share with you most all of the topics we've ever done. We are always open to suggestions from parents or staff, but we've found that most people "don't know what they don't know" and often have trouble pinpointing what specifically they'd like to hear about! I love that parents feel supported here. I think every time we finish it up, parents feel like "hey, I'm not the only one" dealing with this issue or need help relating to my teenager in this way. Parents share anecdotes and experiences, connect with one another, chat informally with school counselors, and actually learn something they can take away. Do you host something like this at your school? What topics have been helpful or most popular for your parents?